Many at the University of Manchester will be familiar with the name Samuel Alexander: his memorial building is part of the School of Humanities. What may not be widely known is that we have Alexander to thank for the early development of psychology in the UK, and for introducing psychology to Manchester. Before joining the Philosophy Department at the University of Manchester in 1893, Alexander studied experimental psychology in Germany, hoping to commit to ‘new psychology’ and to bring it to his teaching. He was one of the few members of the British Psychological Society in its conception and, by 1902, he had started an experimental psychology lab class at Manchester. In addition, he gathered other scientists, such as the pathologist Lorrain Smith and the famous physiologist Charles Sherrington, to further encourage psychological research; to top it off, Alexander planned to establish a department of psychology. Alexander searched for the perfect lecturer for the department, deliberating between American, German and British psychologists. He first set his sights on C.S. Myers, but he was ‘lost’ to King’s College London. The place was later offered to an undergraduate by the name of Tom Pear (pronounced ‘peer’). Pear was a physics student at King’s but, after attending Myers’ lectures, became obsessed with the psychological issue that underlies all science – that scientific observation requires an observer. Pear’s attention was caught by Myers’ insight, so much so that he went on to become his protégé, alongside Cambridge psychologist Frederic Bartlett. Nudging from both Alexander and Myers resulted in Pear’s arrival at Manchester. One dark winter afternoon, Pear was approached by Alexander in a corridor at UCL (where Pear regularly attended lectures). There, Alexander proposed the idea of a department of psychology at Manchester, the only catch being that Pear needed to obtain a first. As luck, and hard work, would have it, Tom Pear gained his first class degree at King’s, and was rewarded with an invitation to stay in Alexander’s home. At this point, several important figures at the university ‘looked him over’. Having gained their approval, Pear was sent to finish his studies under guidance of Oswald Kulpe in Würzburg, Germany. He returned to Manchester in 1909, to his new role as their first lecturer in psychology, and was elected to the BPS. In his new role, Pear discussed science with noted figures (such as the physician Elliot Smith), immersing himself in the social life at the Medical School. Pear’s own reflections only briefly mention the start of his career in Manchester, but reminisce fondly of the scientific ‘prayer meetings’ that took place. In these meetings, academics would gather to set out their ‘scientific creed’, and debate the pressing questions of the time. Amongst this group were Samuel Alexander, Ernest Rutherford (the ‘father of nuclear physics’), Elliot Smith and Niels Bohr (the Danish Nobel-prize winning physicist, who set the foundations for quantum theory and atomic structure). These interdisciplinary meetings provided stimulating academic debate for Pear and later helped him to expand pathological and psychiatric education and research at the university. Pear also reflected on his early interest in ethnology, stemming from worries about the lack of cultural differences in mainstream psychology. In particular, he noted that Carveth Read’s UCL lectures were ‘compiled by someone who had no first-hand contact with any civilisation less sophisticated than that of the peoples of Western Europe’ (Pear, 1960, p.227; see tinyurl.com/k2jbmcp). Pear’s interest in ethnology and in obtaining multiple perspectives on psychological problems mirrors his later achievements in bringing together disparate areas of psychology, moving away from his contemporaries’ linear, Western-centric views on subjects. An important psychological shift in Pear’s thinking is also apparent in his veering away from an early Freudian approach, in which he had diarised dreams and discussed them with BPS members. Through the Manchester ‘prayer meetings’ he began to question Freud’s belief in the ‘fundamental similarity of the human mind’. This term suggested a base psychological foundation to every human being. Elliot Smith, however, considered this too vague – humans certainly shared key physical features, but he was unconvinced that this extended to psychology. Freud’s view was based on observations that people in distant lands shared similar habits, beliefs and customs. Shrewdly, Smith pointed out that these lands had often been visited by Christian missionaries, so apparent similarities could reflect newly learned behaviours and the biased methods used to study and report them. Alongside their clear influence on Pear’s work, these formative experiences regarding ethnology and Freud provide remarkable insight into the nature of debates in psychology and the BPS as the 20th century began. The First World War tore Pear and Smith away from Manchester and thrust them into the Military Hospital in Maghull near Liverpool. There, Pear engaged in therapy and teaching to wounded soldiers, increasing his prominence in psychology and psychology’s prominence in Britain. His work with Smith in Maghull led to significant advance in the understanding of ‘shell shock’. In his reflections about Maghull, Pear discusses the unpreparedness of civilians for the experiences of war. The sudden shift from a psychology of peace to one of hatred was deemed too much to bear for many soldiers. Pear also questioned whether those who developed ‘shell shock’ or post-traumatic stress disorder, as it’s now called, were somehow predisposed to it. A commonly held government and military view was that those with shell shock would have developed an equivalent condition in their everyday lives, thereby washing their hands of the responsibility. Pear’s view was that the extent of horror (gathered from the soldier’s personal stories of trench warfare), and techniques used to instil a psychology of hatred in soldiers, were such to greatly exacerbate any such predispositions. These observations led Pear and Smith to write an influential book, Shell Shock and its Lessons, making the case that more investment was needed in the mental health of veterans. 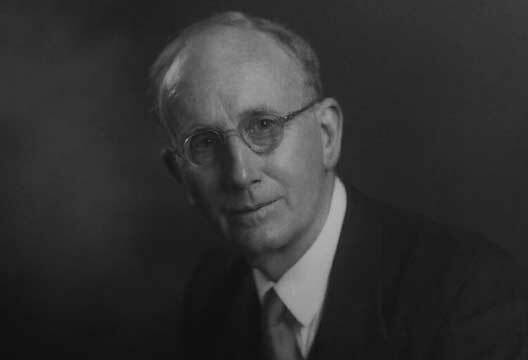 Upon returning to Manchester in 1919 Pear was promoted from lecturer to Professor, establishing a new department of psychology and, in the process, becoming Britain’s first full-time Professor of Psychology. He remained a professor in Manchester for the following 32 years. In that time he was joined by only a handful of other academic staff, many of whom are remembered to this day, such as R.H. Thouless and H.E.O James. Despite the small department, Pear’s connections and contacts brought together multiple areas of psychology at the university, including industrial, occupational, anthropological and social psychology. More broadly, he engaged and collaborated closely with scientists from a range of physical and social disciplines (including noted correspondences with Professor A.V. Hill). Throughout his writing Pear emphasises harnessing the skills of others – sticking to one’s own field but working with other experts to achieve greater insight. His concerns about people overstepping their own domain of expertise has been immortalised in his famous quote: ‘We should be on our guard against the temptation to argue directly from skill to capacity, and to assume when a man displays skills in some feat, his capacity is therefore considerable.’ This quote’s roots can easily be identified from Pear’s work, his ‘prayer meetings’ and his gathered learning from esteemed colleagues in Manchester, London and Maghull. Despite Pear’s time, effort and contribution to psychology, his name is now remembered more for his legacy within Manchester than for the legacy of his work. The range of psychological disciplines within the northwest, and the UK more broadly, perhaps stands testament to this. Today, psychology has considerably outgrown its early roots in philosophy with the diversity, depth and breadth that Pear hoped for, but may not have expected. - Natalie Bigbie is a BSc Psychology student at the University of Manchester. - Nils Muhlert is in the Division of Neuroscience & Experimental Psychology, University of Manchester.